Four Seasons by Antonio Vivaldi, Lyric Pieces by Edvard Grieg or Preludes by Fryderyk Chopin on saxophones? Sounds like a crime on music in the purest form, and deliberately premeditated. If the deceased had a voice, we would certainly ask the composers themselves what they think about this album, but judging by the number of hits of the band’s single (“Storm” Antonio Vivaldi – about 30 millions views) on the Internet, music lovers fell in love with such a sound. 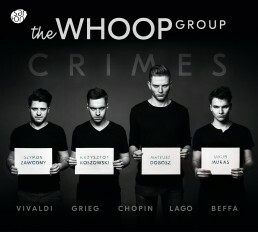 For those and for all intrigued people, we have great news – the CD with crimes on the music of The Whoop Group is now available and waiting for you on the store shelves.